Receptor tyrosine kinases (RTKs), a family of cell-surface receptors, which transduce signals to polypeptide and protein hormones, cytokines and growth factors are key regulators of critical cellular processes, such as proliferation and differentiation, cell survival and metabolism, cell migration and cell cycle control [1-2,4]. In the human genome, 58 RTKs have been identified, which fall into 20 families . All RTKs display an extracellular ligand binding domain, a single transmembrane helix, a cytoplasmic region containing the protein tyrosine kinase activity (occasionally split into two domains by an insertion, termed the kinase insertion), with juxta-membrane and C-terminal regulatory regions. Agonist binding to the extracellular domain evokes dimerization, and sometimes oligomerization, of RTKs (a small subset of RTKs forms multimers even in the absence of activating ligand). This leads to autophosphorylation in the tyrosine kinase domain in a trans orientation, serving as a site of assembly of protein complexes and stimulation of multiple signal transduction pathways, including phospholipase C-γ, mitogen-activated protein kinases and phosphatidylinositol 3-kinase . 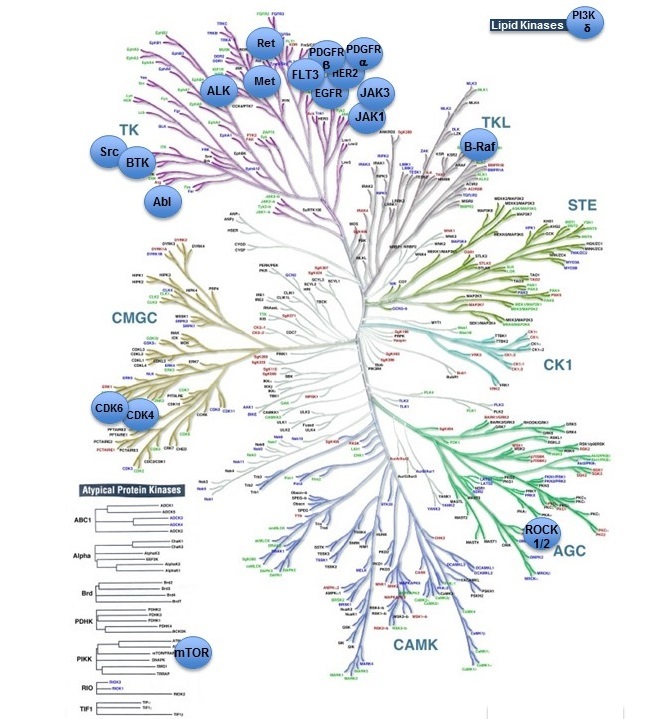 RTKs are of widespread interest not only through physiological functions, but also as drug targets in many types of cancer and other disease states. Many diseases result from genetic changes or abnormalities that either alter the activity, abundance, cellular distribution and/or regulation of RTKs. Therefore, drugs that modify the dysregulated functions of these RTKs have been developed which fall into two categories. One group is often described as ‘biologicals’, which block the activation of RTKs directly or by chelating the cognate ligands, while the second are small molecules designed to inhibit the tyrosine kinase activity directly. Receptor tyrosine kinases (RTKs). Accessed on 19/04/2019. IUPHAR/BPS Guide to PHARMACOLOGY, http://www.guidetopharmacology.org/GRAC/FamilyDisplayForward?familyId=304.